Staffers who worked inside the Beltway or inside city hall are finding jobs outside, in technology and nongovernmental organizations. Skills developed in politics – ranging from grassroots organizing and political campaigns to political communication and economic development – are highly coveted, according to the November LinkedIn Workforce Report. Tech employers, along with NGOs and universities in the San Francisco Bay Area, Seattle and New York City are actively hiring a workforce with a political background. In state capitals like Nashville and Denver, state government agencies and universities are the top employers for people with a political background. The rising demand from tech companies and NGOs is a trend we’re keeping an eye on. On the national jobs front, hiring across the U.S. was 24.1 percent higher this October than it was in October 2016, lifted by the oil and energy industries, which continued to add more workers, and had the biggest year-over-year increase in hiring (33 percent higher). Manufacturing and industrial (26.3 percent higher) and architecture and engineering (23.3 percent higher) were second and third. Hiring in these industries has been consistently strong since the beginning of the year. Seasonally-adjusted hiring (hiring that excludes seasonal hiring variations – like companies hiring less in December due to the holiday season) was 0.3 percent higher in October than in September this year. 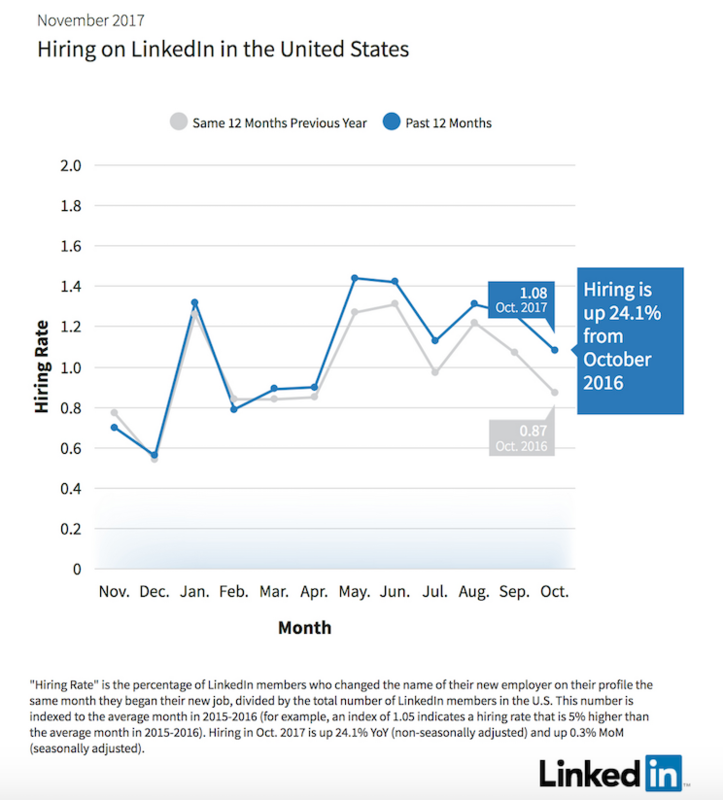 Click here to read more of our November LinkedIn Workforce Report, including which cities are losing the most workers, and which are gaining the most. More than 141 million workers in the U.S. have LinkedIn profiles; over 20,000 companies in the U.S. use LinkedIn to recruit; over 3 million jobs are posted on LinkedIn in the U.S. every month; and members can add over 50,000 skills to their profiles to showcase their professional brands. This gives us unique insights into U.S. workforce trends.